This is a very important moment for me. I feel honoured to make a speech about the future of my country here in Norway at the Nobel Institute. Thank you very much for this invitation which I value very much. Thank you also for your interest in my country. This is what I find most pleasant here. Yabloko thinks that the officials of the Government and the Navy should not make any assumptions that the crew of the submarine �Kursk� is dead until all rescue possibilities have been exhausted. Observers and commentators cannot complain that nothing has happened on the eve of the forthcoming political autumn, which promises to be hot. How can we assess the regime's relations with the political elite? After all, the success or failure of the reforms depends to a large extent on their support. One of the principle changes in the tax system, which will be discussed by the Duma today, concerns the transition in VAT payments with CIS countries to the principle "country of destination". What does this mean for Russia? Soviet Economics: Out With the Old And in With� What? MOSCOW � Hidden behind a high concrete wall on the southern edge of Moscow is a cluster of dachas for the Russian government elite. Cooks serve up meals three times a day, while maids deliver wicker baskets of the best sausage, cheese and vodka for snacks. Chauffeur-driven black Volga sedans stand ready to whisk the pampered residents to town. � MOSKAU, 25, Januar. Der liberale ?konom und Leiter der Duma-Fraktion �Jabloko", Grigorij Jawlinskij hat den Westen angesichts der russischen Wirtschaftskrise zu ehrliehen und direkten Verhandlungen mit Ru?land aufgefordert. Der Westen m?sse eine andere Einstellung gegen?ber Ru?land zeigen. W.A. DAVOS, 31. Januar. Die Absicht der Vereinigten Staaten, sich mit einem Raketenabwehrsystem zum Schutz gegen terroristische Anschl?ge auszustatten, hat auf russischer Seite ein entsprechendes Echo gefunden: In Moskau wird dem Vernehmen nach ernsthaft erwogen, darauf mit dem Vorschlag an die europ?ischen Nato-Staaten zu reagieren, gemeinsam mit Ru?land ein ?hnliches System auf dem alten Kontinent zu installieren. Wie beim Weltwirtschaftsforum in Davos am Wochenende zu erfahren war, wurde diese Idee der amerikanischen Au?enministerin Albright unl?ngst bei ihrem Besuch in Moskau vorgetragen. Sie soll die Anregung �h?chst aufmerksam und positiv" zur Kenntnis genommen haben, sagte der russische Oppositionspolitiker Jawlinskij, der diesen Plan der amerikanischen Besucherin erl?uterte und sich nach eigenem Bekunden in dieser Hinsicht mit dem russischen Ministerpr?sidenten Primakow einer Meinung wei?. It is hard to find the words to express the pain of loss and our endless condolences to all the relatives of the selfless and courageous defenders of our Motherland who died so tragically. The Yabloko faction considers it necessary to conduct an independent parliamentary enquiry into the causes of the accident, in particular the rescue operation of the nuclear submarine �Kursk�, First Deputy Head of the Yabloko faction in the State Duma, Sergei Ivanenko, told journalists today. Nikolai Travkin is leaving Yabloko Association and the Yabloko faction in the State Duma of the RF. He duly notified the leadership of the Association and deputies of the faction in his application forwarded to the Deputy Head of the Faction, Sergei Ivanenko. The Chairman of the St. Petersburg branch of the Yabloko Association, deputy of the State Duma of the RF Alexander Shishlov, expressed his regret over Nikolai Travkin�s decision to leave the Association and its parliamentary faction. He made this statement on August 2, 2000. Answer of the Deputy Public Prosecutor of Krasnoyarsk Territory to Letter No 15.129-2000 of Guarantee of Sergei Ivanenko of 19 July 2000. Information leaflet to the inquiry of the State Duma "On the parliamentary inquiry of the State Duma..."
Alexandr Makarov (Krasnoyarsk): "Viktor Khamrayev, Deputies, Demonstrate Solidarity with Their Former Colleague"
Yesterday the Duma supported its former deputy Viktor Gitin (Yabloko), subject to criminal proceedings by the Public Prosecutor of Krasnoyarsk Territory since March 2000 for "accepting a large bribe". The Deputy Head of the Yabloko faction, Sergei Ivanenko, thinks that the meeting between the President of Russia Vladimir Putin and representatives of large-scale business on July 28, 2000, was convened as part of a consultative process and was virtually a working meeting. Ivanenko said that this was a "useful discussion" for both sides. Deputy Chairman of the Yabloko faction, Sergei Ivanenko, thinks that the State Council can only be a consultative body under the President of the Russian Federation: "In general I do not attach great importance to this structure," said Ivanenko in an interview with journalists on July 28, 2000. He also pointed out to journalists that at present there are "multiple councils, and the State Council will probably become another one". Question: Sergei Viktorovich, what was the main conclusion that Yabloko drew at the 8th Congress over its defeat in the parliamentary and presidential elections? Ivanenko: The most important result can be summed up as follows: we have managed to keep the party intact. Sergei Ivanenko calls on the Russian authorities to alter its relations with business "from a state of war at least to a state of truce"
Deputy Head of the Yabloko faction, Sergei Ivanenko, thinks that the meeting of the President of the RF Vladimir Putin with representatives of large-scale business should not be based on " purely protocol". In an interview with journalists on July 24, 2000, Ivanenko added: "The Russian authorities should move on in their relationships with business from a state of war at least to a state of truce." On July 19, 2000 the State Duma adopted a decision to forward a parliamentary request to Public Prosecutor General Vladimir Ustinov on the criminal prosecution of Viktor Gitin, deputy from the Yabloko faction of the State Duma of the second convocation. The Yabloko faction plans to insist that the increase in excises on oil products should not be as significant as the amount planned by the government. Such a decision was adopted at a meeting of the faction on July 4 on the threshold of votes on another article from Part II of the Tax Code. The government plans to raise excise duties on oil products to compensate for the abolition of turnover taxes. Deputy Head of the Yabloko faction in the State Duma, Sergei Ivanenko, thinks that a special commission should be formed up in the State Duma to investigate the situation around the �Kursk� submarine. According to an exclusive interview with RBC today, Yabloko will insist on a parliamentary investigation into this situation to obtain answers to the questions as to what was decided, who decided and how was it decided that people's lives should be saved. The Yabloko party thinks that the "leadership of the country bears political responsibility for the explosion at Pushkin Square". Deputy of the State Duma from Yabloko, Alexei Melnikov, made this statement in an interview with an ITAR-TASS correspondent. The leadership of the country and the law-enforcement agencies bear political responsibility for today's explosion at Pushkin Square, noted Deputy Head of the Yabloko faction in the State Duma of the RF, Sergei Ivanenko, in an interview with the Echo Moskvi radio station. The main thing that happened during Putin's year is that Yeltsin's era ended first in actual fact and then legally. A new stage of the country's development was launched. Putin's activity is in public view: he began an anti-terrorist operation in Dagestan which grew into a military conflict, he is trying to implement economic reforms and reform of the federative structure. I am deeply shocked by the incident and express my sincere condolensences to all the injured and their relatives. I hope that the investigation will discover the actual culprits behind this tragedy. The Yabloko Association believes that changes needs to be made to the procedure for forming both the Federation Council and the State Duma. 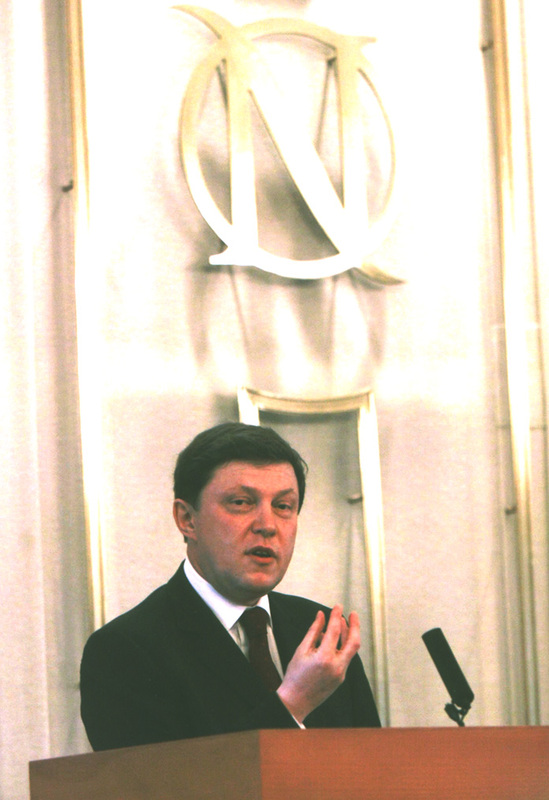 On August 4, 2000, Deputy Head of the Yabloko faction in the State Duma Sergei Ivanenko told journalists that an inquiry to the Constitutional Court has been drafted, which contains a request for more precise interpretation of the articles of the Constitution, "to be more precise, to explain what is understood by the term "formation" of the Federation Council and whether the direct election of members of the upper chamber is possible within the context of said interpretation". Deputy Speaker of the State Duma, Vladimir Lukin (Yabloko faction), believes that it would be irrational to vest some constitutional functions with the State Council. "In this case we would have a tri-cameral parliament", noted Vladimir Lukinin in an interview on August 3, 2000, commenting on the words of President Putin that the State Council might be accorded constitutional status. Deputy Speaker of the State Duma, Vladimir Lukin (Yabloko faction) believes that in September participants of the Palestinian - Israeli talks may sign a framework agreement on an interim stage to the resolution of the conflict.